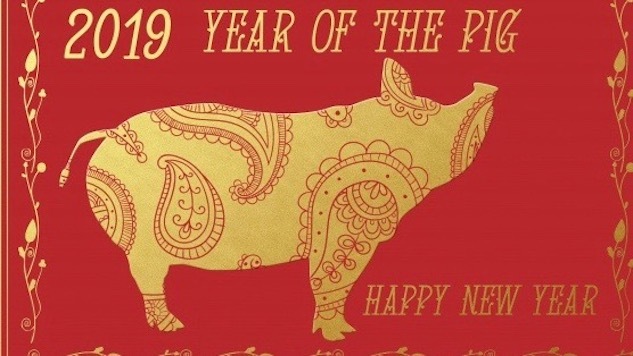 Lunar New Year falls on February 5th this year, and we’d like to offer you some suggestions as you plan to usher in the Year of the Pig. The Pig is the 12th and last sign in the zodiac. To greatly oversimplify an old and complicated astrological system, if you are born in a Pig year, you are likely to be compassionate, with a generous nature and good odds of remaining cool under pressure. You like to finish what you start and are not easily distracted from your goals. So, if your goal is to apply your native diligence to upping your cocktail game, read on. We’ve got you covered with some Lunar New Year inspired potables, and we resisted the considerable temptation to spotlight drinks with bacon garnishes. First of all, if you happen to be in, or heading to, San Francisco-well, you’re in luck because there is no polar vortex here and it’s a world class spot to toast the Lunar New Year. If you’re not going to be in the Bay Area, the St. Regis San Francisco has shared a couple of seasonal cocktails made in partnership with Suntory, so you can play with them at home. They’re in the “elegant and simple” range so you won’t be decocting 17 rare herbs by moonlight or making your own wildcrafted food dyes or anything; their green tea yuzu syrup might take a click or two if you don’t live in a neighborhood where yuzu juice is a supermarket item; it’s worth it, no other citrus tastes like yuzu. Directions: Shake (or stir…) vermouth and vodka together, pour into chilled Martini glass, float petals… et voila. Directions: Stir ingredients together in a highball glass over one of those big blocky ice cubes, then skewer a slice of crystallized ginger and drape it artfully across the rim. Directions: Combine syrup and gin in a balloon glass (I’m sure stemless ones will work too). Top with club soda. Float a dash of Szechuan pepper on top, add a strip of lemon rind and, if you like, a fancy pants orchid. If you feel like getting a little more ingredient-intensive, D’USSÉ has a couple of suggestions for you, too, featuring their rather fabulous XO cognac. XO (Extra Old) cognac is blended from batches with a minimum age of six years, and this one, noted for its notes of walnut, chocolate and blackberry, is definitely an investment-happily it will last you a while. Directions: Combine ingredients in a shaker with ice. Shake vigorously and strain into an ice-filled rocks glass. Float a star anise pod on top. Directions: Muddle Lychee, Strawberry and Simple Syrup in a shaker. Add D’USSE XO, Rhubarb Bitters and ice. Shake vigorously and strain into a chilled coupe glass. Top with Champagne. Garnish with a Lychee on a metal skewer. And if you want to ring in the coming spring with a cocktail featuring cure-all miracle ingredient CBD oil, we got this one from Pok Raw Bar in Dallas. It’s pink, it’s tart, it features classic Asian flavors like yuzu and ginger, and if emerging research is any indication, it will cure your insomnia, your anxiety, your chronic pain and pretty much everything else you probably don’t want to bring into the new year with you. Directions: Combine all ingredients into a shaker tin, and shake for 15 seconds, or until CBD powder, if using, is dissolved. Pour into clear glass over ice.